While a lava-spewing, ash-belching volcano on Hawaii’s Big Island was capturing much of the world’s attention, Suzie Keen was on a smaller island nearby discovering one of the most beautiful sights you’ve probably never heard of. The “garden island” of Kauai is only a 40-minute flight from Oahu’s Honolulu, Hawaii’s largest city and home to the iconic, tourist-packed Waikiki Beach, but in terms of vibe and pace it’s like comparing the Gold Coast with Goondawindi. Kauai is also less well known than the Big Island, but while its erupting Kilauea Volcano has been grabbing headlines, Kauai has been struggling with its own natural disaster after torrential rain and flooding damaged homes and businesses and closed the road to the island’s north. 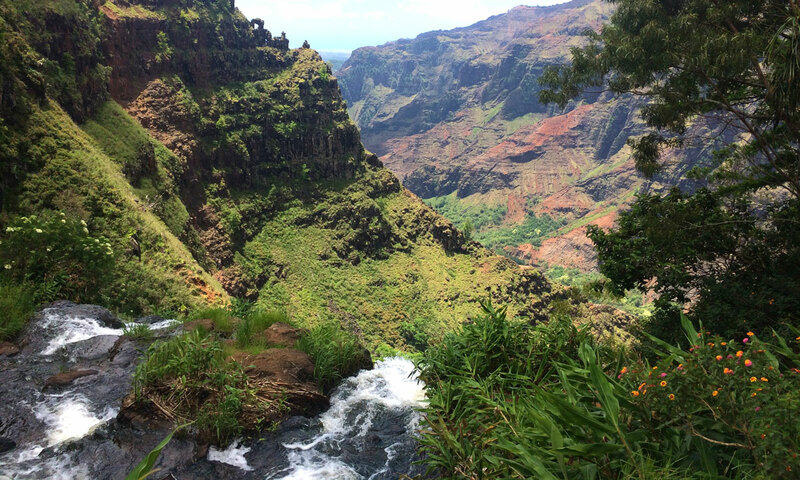 The climate isn’t the only attraction of Kauai’s west side; it’s also the gateway to the breathtakingly beautiful Waimea Canyon, which Mark Twain is said to have described as “the Grand Canyon of the Pacific”. It’s where you’ll find the Kauai brewery, the historic and arty township of Hanapepe – home of “the westernmost bookshop in the US” – and Port Allen, the departure point for numerous boat trips around the scenic Napali Coast. 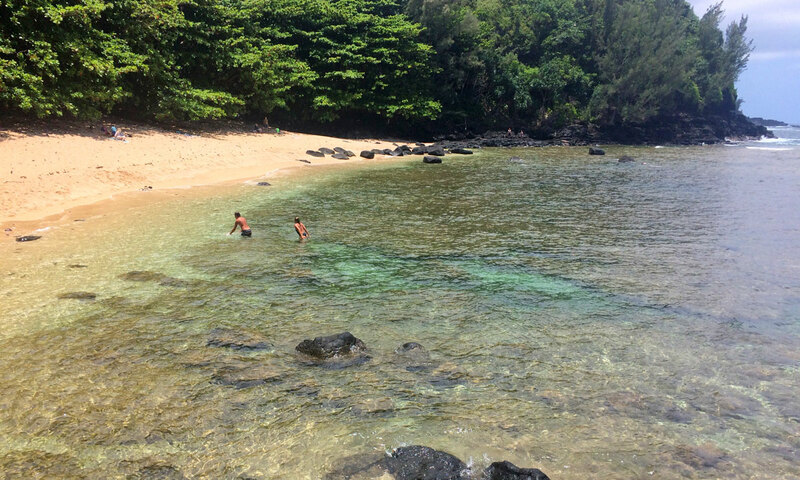 Tourist literature often uses words such as “sleepy” and “laidback” to describe the west, saying it retains the feel of “old Hawaii”, and the seaside village of Waimea lives up to that promise. High-rise-free and with fewer tourists than towns on the island’s east and north coasts, it exudes a slightly grungy charm, with roadside stores and restaurants selling fresh coconuts, fish tacos, “chicken in a barrel” (a local restaurant specialty) and red-dirt T-shirts (another local speciality, inspired by the ochre soil). From the township, Waimea Canyon, in the Waimea Canyon State Park, is around a 30 to 40-minute drive inland and local advice is to go earlyish in the morning for the best chance of a clear view from the lookout. Even shrouded by a fine haze on the first day we visited, the canyon took our breath away. Around 16km long and 900m deep, it is the largest in the Pacific and partly a legacy of the collapse of the volcano that created the island around five to six million years ago. The forces of nature have carved away layers of lava and earth, and the name Waimea (meaning red water) comes from the colour of the water that floods the area after heavy rains. From above, the canyon appears to be a thousand different shades of red, ranging from the palest rusty hue to the deepest ochre, cut through with swathes of rich rainforest green and soft moss. Amid the craggy peaks and plunging gorges, the spectacular 244m Waipoo Falls are like a beacon for many hikers – ourselves included – eager to reach their source. The canyon walk is one of dozens of hiking trails in the Waimea Canyon and Kokee state parks and takes up to two-and-a-half hours. In parts, the track is rough and uneven, with plenty of up and down, but it’s worth the effort. The waterfall may be the major drawcard, but it’s the vertigo-inducing view below that sets your head spinning; sit on a red rock for a few moments just to hear the gasps from hikers behind you when they catch sight of the dramatic drop. Further incredible views await – hopefully – for those who continue wending their way up the highway to the Kalalau and the Pu’u o’kila lookout (right at the end of the road). On the first day we drove there, we encountered a whiteout: a thick blanket of fog created the feeling we were looking out over snow – a surreal experience when you can hear the faint sound of an invisible faraway ocean. We returned to both lookouts the following day and were rewarded with clear vistas all the way to the stunning Napali coastline and the Pacific waters beyond. Between the Waimea Canyon and the upper lookouts, the Kokee Lodge is a good spot to stop for lunch – which you can share with the chickens in the picnic area if you wish – or a very strong cold brew coffee, while the adjacent history museum offers information about the unique wildlife and flora to be found in the surround forests, plus maps of the hiking trails (highly recommended). 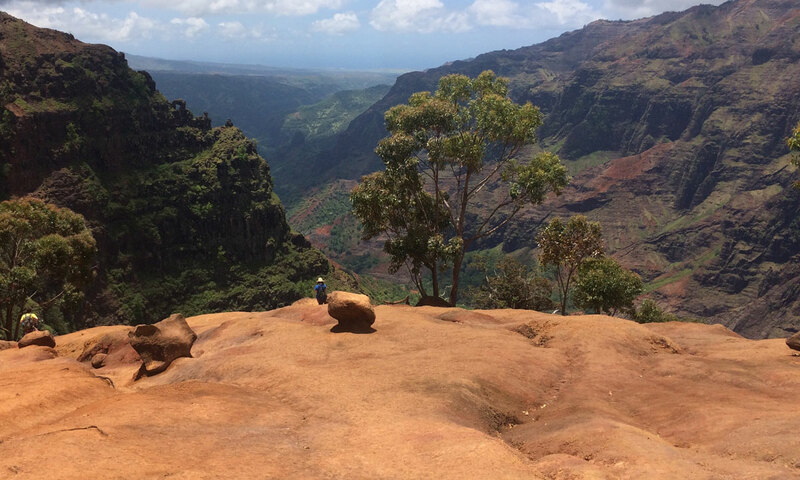 Kauai is small enough that you can easily explore the whole island in a week or so. There’s just one main highway connecting all the towns, so hiring a car is a good way to visit the highlights. Hanalei is a lovely, must-visit surfer town on the North Shore with good shopping, restaurants and bars. Check out the Hanalei Bread Co, which serves the best coffee we had anywhere in Hawaii (sister business Bar Acuda restaurant also comes highly recommended) and Tahiti Nui, the small bar-restaurant where George Clooney and Beau Bridges share a drink in The Descendants. 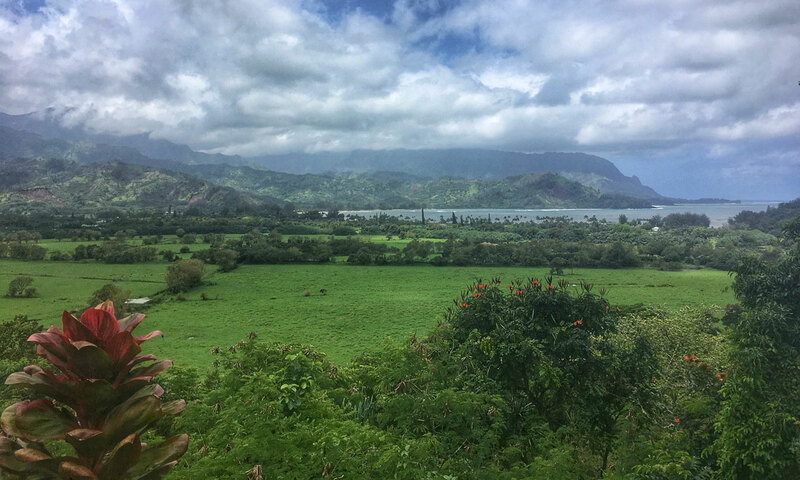 Speaking of films, if the lush tropical landscapes around Hanalei and other parts of Kauai seem oddly familiar, it’s because most of the first Jurassic Park movie was filmed here. Not far from the airport at Lihue, you can also visit the Wailua Falls, recognisable from the opening credits of long-running TV series Fantasy Island. To the south of Hanalei is the perfectly manicured and lush, condo-filled community of Princeville. While it might seem difficult to escape the holiday complexes here, those with a sense of adventure (and a good travel book) may by lucky enough to find a secluded swimming and snorkelling spot like the one below. Further north is Tunnels Beach, said to be the ultimate snorkellers’ and scuba divers’ beach, with a high chance of seeing sea turtles (or honus, as they are called in Hawaii), and the start of the 17km Kalalau Trail, which offers stunning views of the Napali Coast, but the road to these places is currently closed due to the recent floods and unlikely to open again for some months. Nonetheless, most of Kauai remains open for business, so it’s a great time to visit the island and spread some aloha. You’re guaranteed a warm welcome from the locals – both human and feathered. A resident rooster at Waimea Canyon lookout. Getting there: Hawaiian Airlines operates daily flights from Honolulu to Kauai’s Lihue airport, with the trip taking around 40 minutes. Getting around: Hiring a car at Lihue airport is the best option. Theoretically, it should take only a couple of hours to drive from one side of the island to the other, but because there is only one main highway, you may encounter traffic jams around some of the towns. There are also plenty of places to stop and explore both on and off the highway. Staying there: We stayed at West Inn Kauai – a basic but clean, comfortable and affordable hotel in Waimea – and at one of the many Airbnb condos available at Princeville. Other recommended options include the Waimea Plantation Cottages and, in Hanalei, the Hanalei Surfboard House. For more details about all Kauai attractions, activities and accommodation, visit the official island website. The writer travelled to Kauai at her own expense.